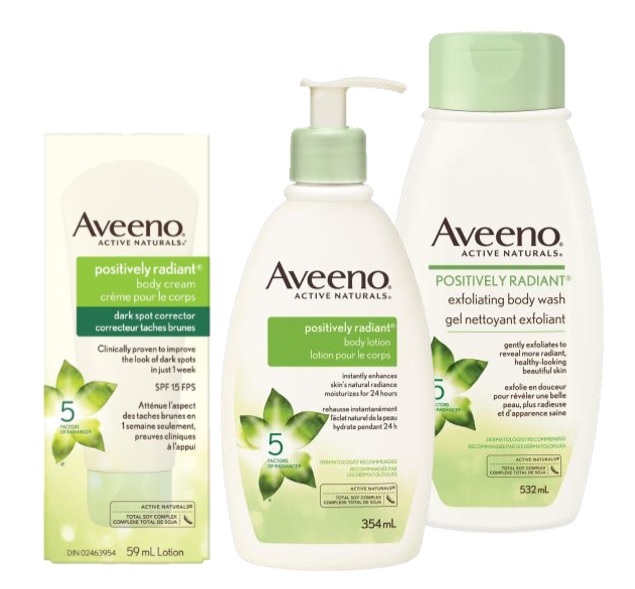 Aveeno's best-selling radiance-boosting facial care collection - Positively Radiant - is now available for the body! Containing the same Total Soy Complex that works to visibly transform the look of all 5 factors of radiance including: tone, texture, dullness, blotchiness and brown spots. Aveeno Positively Radiant Exfoliating Body Wash - 532ml - $11.49 - enriched with natural exfoliants to gently wash away dry, dull skin to reveal softer, smoother skin and harnesses the power of total soy complex to help enhance skin's natural radiance and leave it feeling moisturized. Aveeno Positively Radiant Body Lotion - 354ml - $13.49 - the non-greasy formula with total soy complex is infused with light reflecting minerals to instantly enhance dull, dry skin with natural radiance for beautiful, luminous skin along with rich emollients that lock in moisture for a full 24 hours to leave skin softer and smoother. Aveeno Positively Radiant Body Cream Dark Spot Corrector - 59ml - $11.99 - with an oil-free formula that transforms dry, dull skin by fading the look of dark spots, discolouration and uneven skin tone in just 1 week with continued improvement over time for beautiful, healthy-looking, radiant skin. It also contains a SPF 15 to protect from the sun but I would recommend using another sunscreen on top of at least SPF 30 to keep the dark spots from reappearing! Available now at drug, grocery and mass retailers across Canada.